Three is one of the leading mobile network operators in Sweden and the fastest growing mobile network in the UK. 60% of the company is owned by Hong Kong-based Hutchison and 40% by Investor. 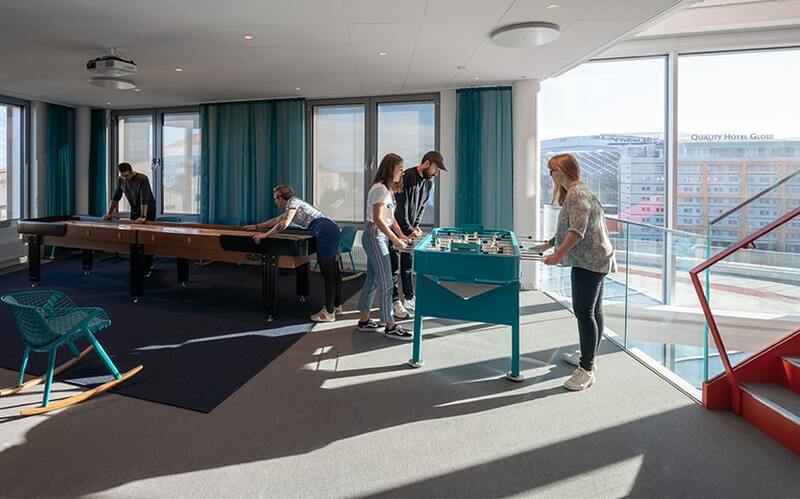 Recently Three built a new headquarters, known as the 3-House, which accommodates approximately 900 employees at the Globe Arena in Stockholm, Sweden. The new HQ house all sorts of operations, including customer service, technology, organization, finance, sales and more. Three's journey has been marked by rapid and efficient expansion. They had been working out of their old location for a long time, but as they continued to expand, they noticed they were growing short on space. They began looking into whether they should renovate or rebuild, and it soon became clear that starting anew would be a better option. Before construction began, they did an extensive amount of background research to help crystallize the vision for the new workplace. 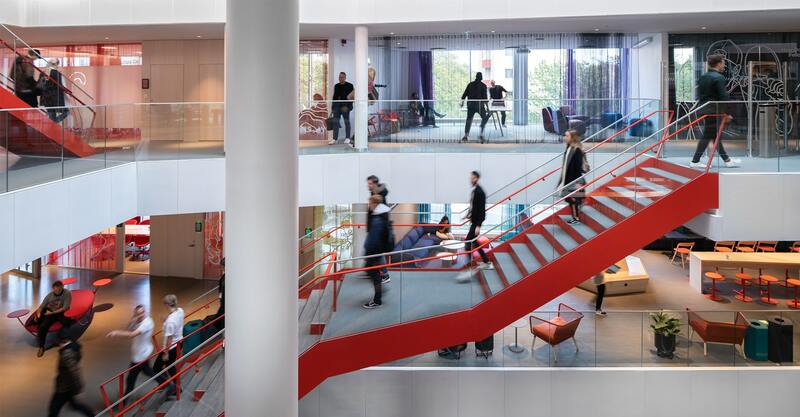 They wanted the design of the new workplace to match the corporate culture that had developed at Three – and this is where the story becomes quite interesting. 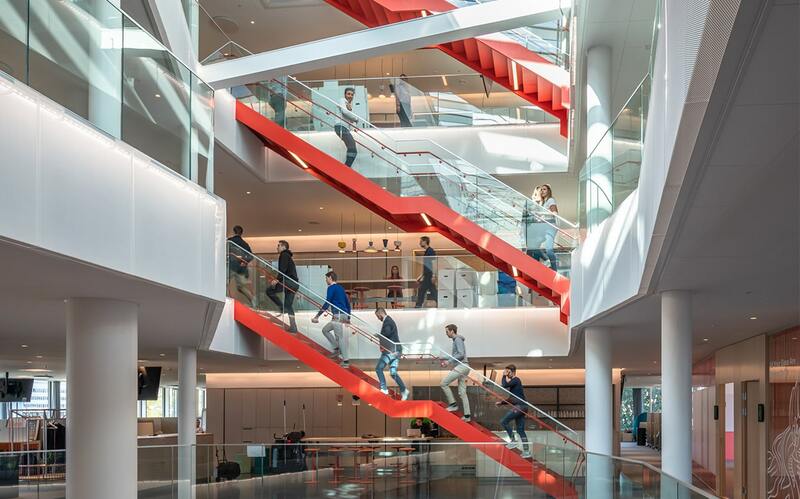 It’s commonplace for companies to move to a new location, but when you have the opportunity to build from scratch, you can gear everything to your specific office culture. How did Three determine which components were essential, what qualities were important, and what elements were actually needed? 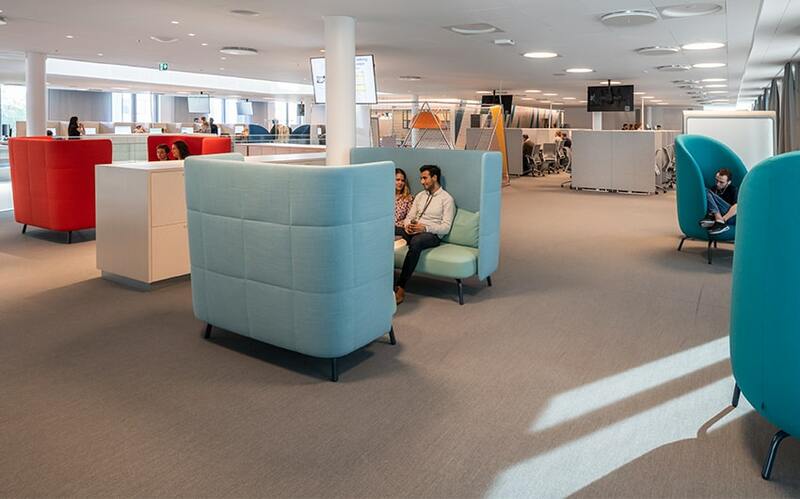 To gain insight into how they managed to create an efficient work environment for 900 people all in one location, we talked to Helena Körberg, Three's design lead on the project. Here she talks about the development process, reveals her insights into the venture, and explains how Meetio came into the picture. We have a fantastic culture at Three, and we were clear in our vision that the new headquarters must match the culture. We know from experience that our office culture is a large part of our success. Everyone at Three shares the vision and we all work to uphold our strategic cornerstones. That, combined with our commitment to our strong values, gives us the capacity for great agility. 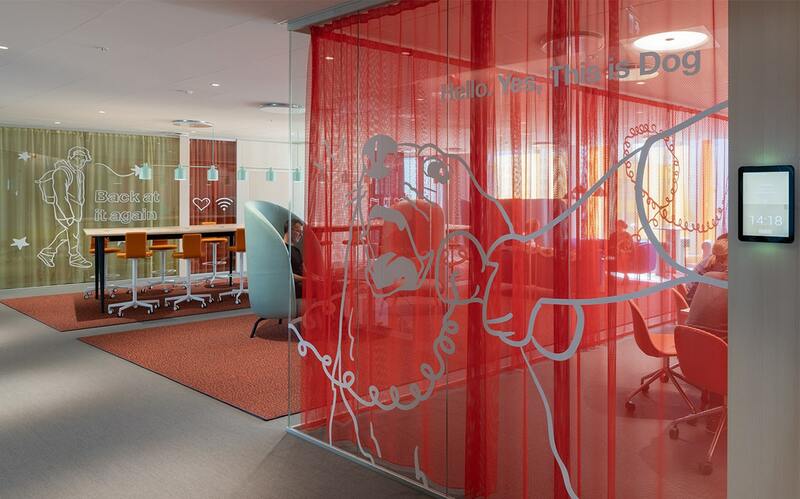 We therefore wanted to create a workplace that would strengthen our culture. The opportunity to build a completely new office, where we could influence the design so that it would fit our culture, felt right for us. 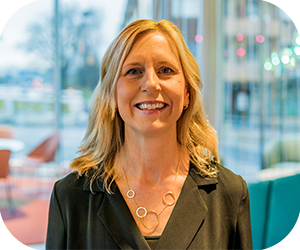 Helena Körberg, design lead on the 3-House project. Through our in-depth interviews, it was clear that certain types of work spaces were missing. Our old premises had a more open floor plan with desk workspaces. Our employees wanted the opportunity to work in more varied environments. Such a diverse working space makes it easier to collaborate across departmental boundaries and facilitates spontaneous meetings. We were also missing space for focused and undisturbed work - the chance to get away and be in a place where you can simply focus on a single task without being interrupted. Our employees also sought better opportunities for recreation. We work in a fast-pace environment, and sometimes you need to take a short break in order to be more productive for the rest of the day. How have those needs been met with the new office? 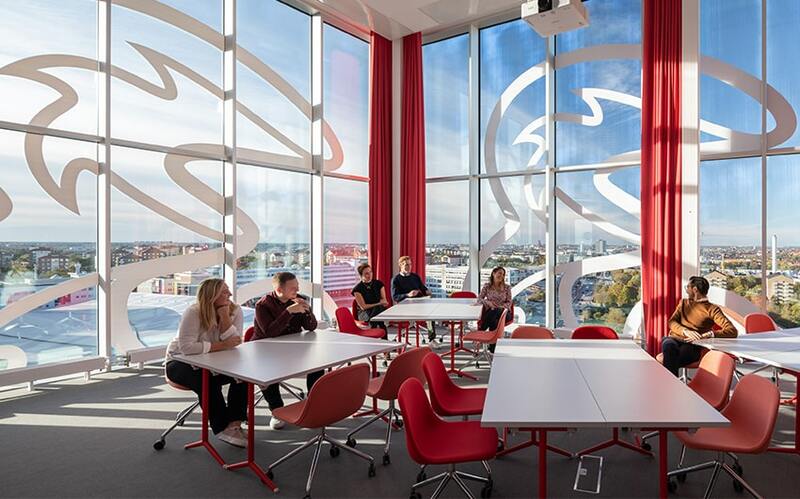 In the new 3-House, there are a variety of different types of workspaces to choose from, all meant to address different requirements, such as providing for silence, collaborative meetings, casual conversations, and focused concentration. We are all unique individuals with different needs. By meeting these varying needs through different environments and workspaces, we create the opportunity for each of us to do our very best. Our goal is to increase both productivity and well-being, as well as to strengthen our culture here at Three. The design was inspired by activity-based offices, but our approach is adapted to us specifically. For many of our employees, this approach means that they sit in different places every single day at the 3-House, while others sit in roughly the same place, and we want to cater to both of these types of individuals. It all depends on the role of the person and the tasks involved. 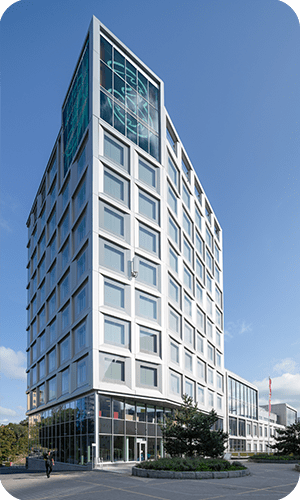 For example, some of the workspaces on three of the fourteen floors are specially adapted for telephone work; employees who have daily customer contact over the phone will often place themselves on these floors. YWOW creates great opportunities to realize our values in the office, much more than we could at our old headquarters. I find that most employees also think that YWOW works well and feels right for us. Our top criteria for a room booking system were that it would be user-friendly and easy to use. We wanted a system that could help break the vicious circle that occurs when booked rooms are not actually used. It was also important for us that the room booking system would be integrated with Outlook, as that is how we usually set up meetings. We also wanted a system that had a mobile app so that we could easily book rooms on our smartphones. What was it like, introducing Meetio to the employees? When we instituted the room booking screens, it all worked very easily. They are rather intuitive, so the employees didn’t need any instructions on how to use them. It was slightly problematic at first because many people forgot to check into a room that they would use, since someone else might come in thinking it was vacant. But this actually served as a good reminder that they needed to check in, and they would usually remember it the next time. The next step is to introduce the Meetio App – a mobile room-booking app that enables employees to easily book meetings and rooms even when they aren’t near their computer. How has everyone responded to the changes, especially in comparison to the old system? The feedback has mainly been about the booking screens, since they make it clear which rooms are reserved so that you don’t have to physically go there and check for yourself. It also has made it very easy to reserve a room spontaneously, for those ad-hoc meetings that arise. It’s much easier in the new 3-House to find available meeting spaces. This is partly because, in the new system, room reservations are released if the room is not used. It is also because we have more types of meeting areas in our new headquarters. We have many open meeting spaces, such as sofas & high tables, all designed to foster communication in open and accessible areas, which is really ideal for some gatherings. One factor for our success has been that we always start from our culture and our values, implementing these in both the design of our headquarters and in our working methods. It meant that many employees felt acclimated to the new spaces as early as the first week in the new 3-House. It has also made it easier to introduce our new working method, since all employees already recognize themselves in the shared values of the company. Through this approach, our new way of working has not felt difficult and foreign, but rather was a natural and obvious transition. We have named all the meeting rooms in the 3-House after things that are part of our interconnected life; i.e. things that we as a company make possible through our network and our products. Each floor has a different theme: so on one floor, all the rooms are named after various YouTube clips, while on another floor they are all emojis, and on a third, music videos, etc.